What to buy the child who has everything? Would you love to buy them something they could keep and treasure forever? If you are looking for something truly special to give to your nearest and dearest then read on! Discover a keepsake gift for children, which is totally personal to them. The team behind The Life Tree wanted it to be so much more than a picture. So they have developed a beautiful book of rhyming verses to go with it. Each Verse of Wisdom describes a scene in the picture. This makes The Life Tree into a really great educational tool. 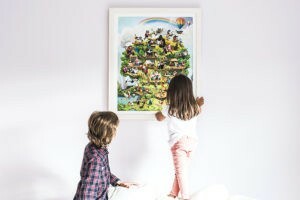 What better way to encourage your children to read than by exciting their imagination with the picture? You can then encourage them to find out more about the characters by reading the book of verses. Interactive technology is second nature to today’s kids. If you are anything like me you will always be looking for great apps to keep the kids quiet for a few minutes. And if the app teaches them something useful as well, then that’s an added bonus! 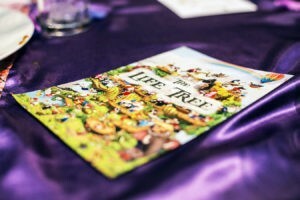 The Life Tree has a free to download app which is available through iTunes. It enables kids to click on a scene in The Life Tree and bring it to life as it’s verse of wisdom is read out to them. Finding a gift for children that are special enough for a Christening, Naming Ceremony, first birthday or Christmas can be challenging. A toy will be forgotten within weeks and clothes will be grown out of. We think a special occasion deserves a special gift that will be kept for a lifetime. I still have my own silver christening cup but doesn’t that seem outdated nowadays? A present that is relevant for the modern world but special enough to stand the test of time is hard to find. The very first Life Tree was sold as a Christening present. A week later we received an email from the delighted parents thanking us for creating such a magical gift. They said they were looking forward to their son growing up and learning about life with the help of The Life Tree. I don’t think it gets more special than that! I hope you enjoyed this little introduction to The Life Tree – the amazingly magical gift for children. Over the coming months check into our blog page on thelifetree.co.uk to find out more. We will tell you about the team behind The Life Tree as well as exciting developments from The Tree. We will also bring you news from and about our charity partners and any good snippets of information that we think you might be interested in. We would love you to join our social media families on facebook, twitter, Instagram and Pinterest. Simply search for The Life Tree and you will find us!